This week is the 1-year Anniversary of The Free-Procurement Project. That’s right, it’s been one year since we launched the world’s first totally free e-procurement system. And even with our 20 years of experience in this business, we could never have predicted how much interest there would be in the Project. 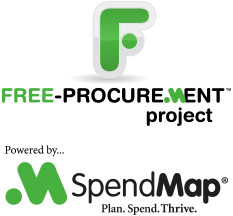 So far, more than 5,000 people in over 100 countries have downloaded the Free version of SpendMap. Our sincere thanks to the entire Free-Procurement community and all of you who helped make this project a success!